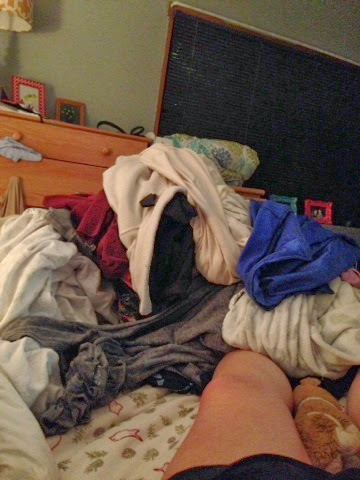 That my friends is the biggest hunk of clothes I have allowed to pile up to date. I will now provide you with a comprehensive list of everything on earth I would rather do than fold and put away this monstrosity. I immediately take that one back. - Hang out with Olivia Pope's mom from "Scandal"
- Completing all the fitness tests that you had to do in elementary school...however someone would need to be hear to hold my feet for curl ups. I roll around like a turtle on its back otherwise. You're welcome for that image. So yeah that about sums my night up. Hopefully no one minds me wearing my Wrestlemania sweatshirt to work tomorrow because all my office clothes are hidden in that pile. With the energy and work ethic I have designated to this task I may be wearing a belted night shirt by Friday. Pray for the residents of my building...for their eyes will never have seen such a sight.